Great sailboat for charter in Barcelona. Capacity up to 10 people for day charter and beds for maximum 10 people for higher overnight charters. Developed between Farr Yacht Design and BMW Group Design, offering maximum volume on their length. The huge swing platform added, 4 double cabins, 3 bathrooms, and a sensational deck equipment make the Bavaria 45 Cruiser a great sailboat versatile for group events, celebrations or boat accommodation, to enjoy sailing and living on board for short trips like half-day, a day or weekend or enjoy a vacation for a week or longer. 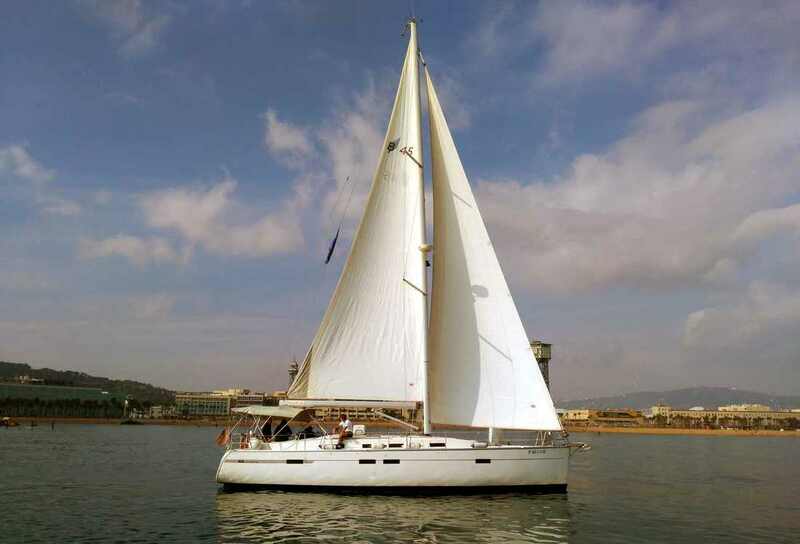 Available in Barcelona Port Olímpic for rent with or without professional skipper and ready to go to other destinations like Costa Brava, Ibiza and Formentera, Majorca and Minorca. Deck equipment: Double steering wheel and double paddle, bow thruster, rolling mainsail and genoa, 5 winches, wind equipment, autopilot, GPS plotter and radar screen, DSC radio, full safety equipment zone 2. Hot / cold deck shower, bimini. Interior: 4 double cabins, convertible salon, 3 bathrooms + shower, electric water heater, gas cook and oven, cd/mp3 player with USB connection, TV in salon, interior and cockpit speakers, battery charger, inverter 12V / 230V , microwave, 2 fridges, full kitchen utensils. VAT 21%, boat insurance and guests, mooring in Port Olímpic de Barcelona, dinghy, snorkeling equipment, skipper, fuel*, drinks (water, beer, sodas, wine, champagne, assortiment of spanish sandwiches (iberic ham, salmon, vegetables). *In day cruise, the fuel is not included: €7,00/hour of engine ON.